You'll SAVE $100 on your choice of SEVEN exceptional selections – plus receive 3 FREE bottles of sumptuous Black Pig Reserve McLaren Vale Shiraz 2017 worth $75. A Great New Dozen Approximately Every 12 weeks and at Christmas. Look forward to enjoying succulent reds, crisp whites or a delicious mix of both from around Australia and the world. Each wine handcrafted by talented producers. For a limited time, we’re offering you the chance to secure an introductory club case, complete with full tasting notes about each and every wine to enhance your wine experience. Choose the club that suits you best… then receive exclusive membership! Each club membership is totally flexible and gives you your very own personal Wine Adviser. You take the wines you want, when you want and are completely covered by our 100% money-back guarantee. Call today on 1300 712 870 quoting and enjoy your delicious dozen and 3 FREE bottles. At Virgin Wines we’re proud to show off our proud range of handcrafted, flavor-packed wines. Our close relationship with some of Australia's finest winemaking talents allows us to share these with you at very special introductory prices. We do the hard work; you just enjoy your wine – with our money-back guarantee on every bottle! First, because it's all about choice, select which introductory case interests you most. Call today on 1300 712 870 quoting and enjoy your delicious dozen and 3 FREE bottles! Receive 3 FREE Bottles of Black Pig Reserve McLaren Vale Shiraz 2017 (worth $75). Delivery is charged per case. Click here to see delivery charges. Included in every case you take. If you don't like any of our wines, you get a refund. True Story. No commitment, – you're in charge: Want to find out more about the wines, switch a wine or two in your next case, alter or cancel deliveries – no worries, we'll sort it. If you like you can do this easily online, or by giving our friendly knowledgeable Wine Team a call. And if you're not delighted with any bottle, we'll arrange to collect it and refund you. View the benefits of the club. Approximately 12 weeks later and at Christmas, you will get a glimpse of your next case. NO obligation to take future cases. Saving of at least 15% on normal price with every case. Enjoy 12 great wines & 3 FREE bottles of sumptuous Black Pig Reserve McLaren Vale Shiraz 2017 worth $75. An exclusive offer from Virgin Wines. Try one of these great cases and SAVE BIG! We select new club cases approximately every 12 weeks and again at Christmas. These are the best wine discoveries of the season. Wines for the sunshine in summer and in winter the opposite. Common sense wine selections you’re sure to love. We’ll give you a heads-up when your case is ready to be shipped. That’s your cue to accept it, change the wines in the case, delay delivery or skip the case altogether. It’s totally up to you! If you would like to check your reoccurring delivery charges then simply click here. Whatever case you choose, that is the style you will receive ongoing (for example, if you take a Discovery Mixed Case, then that’s what you will get next time around… if you choose All Star Reds, you’ll receive All Star Reds next time). Change your preference anytime. These club cases put you in complete control. SAVE at least 25% on all future cases. IMPORTANT - YOUR FUTURE CASES: I understand that approximately every 12 weeks (and at Christmas) I will automatically receive my wine case selection (price dependent on the case I have chosen) unless I request otherwise.Future All-Stars Dozen deliveries including reds-only and whites-only options will be $189.99 plus delivery. Discovery Dozen deliveries including reds-only and whites-only options will be $159.99 plus delivery. The Premiere Reds will be $209.99 plus delivery. The credit card that you use to pay for today’s introductory case will be charged for all future club cases. I am under no commitment whatsoever and may cancel at any time. Furthermore, if I do not like a wine for any reason it will be collected and I will be refunded in full. 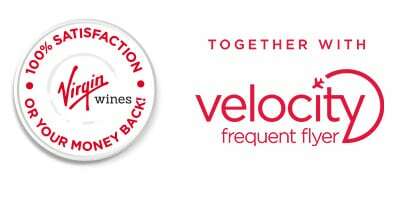 Velocity Terms & Conditions: Velocity Points are earned on the cost of wine only (excluding shipping). Velocity is owned and operated by Velocity Frequent Flyer Pty Limited. To earn and redeem Velocity Points, you must be a Velocity Member. Velocity Membership and Points earn and redemption are subject to the Member Terms and Conditions, available at www.velocityfrequentflyer.com, as amended from time to time. Wines pictured may differ from those you receive in your selection.